I love cauliflower in most forms. The first reason being, the vegetable lends itself beautifully to any recipe and absorbs flavours and spices very well. It can also be chopped into any size large or small and takes very little time to cook. 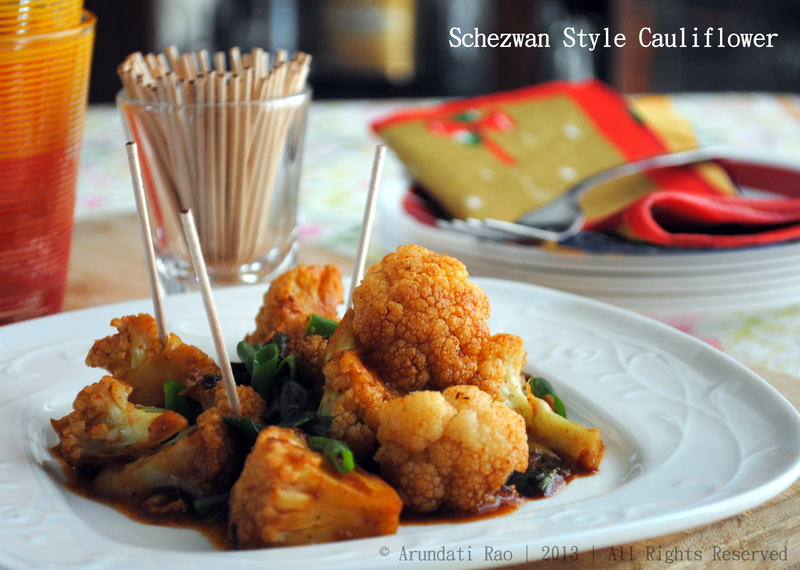 A lot of Indian style preparations, overcook cauliflower and make it mushy. I like cauliflower to be firm yet cooked through and I find that depending on the cooking time, the texture can be preserved. I made this as a party appetizer, but this is a versatile dish and can be served on the side with fried rice or noodles as well. Most grocery stores stock an array of readymade spice mixes. I stock a few to be able to make a few recipes at short notice. One of the mixes that I like is the Schezwan spice mix. there are several brands available and a teaspoon of this adds a nice kick to oriental style gravies, fried rice or even noodles. Steam the cauliflower in sufficient water with salt for 4-5 minutes, drain and set aside. Do not overcook it. 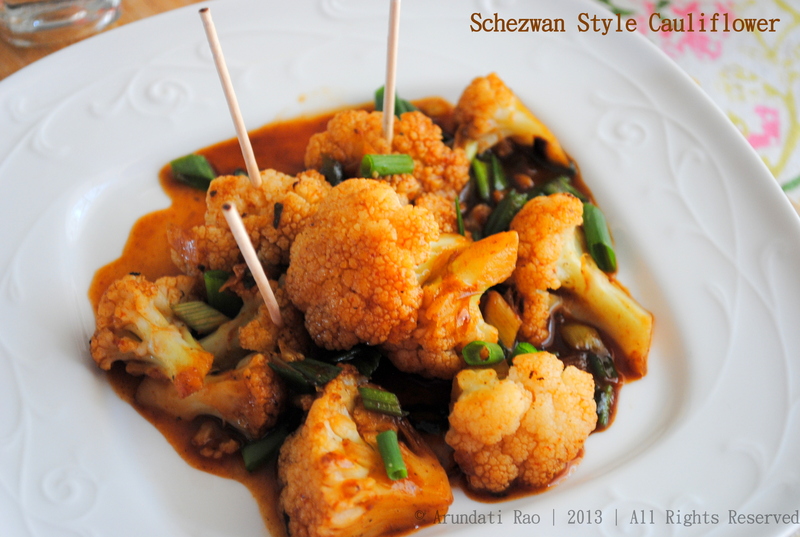 Heat oil in a pan and sauté the cauliflower on high heat till it begins to get golden edges. Sprinkle salt and pepper. Remove the cauliflower pieces to a bowl. In the same pan, add the finely chopped garlic and ginger and fry for a minute. Add the chopped onion and sauté till it turns translucent. Add all the other ingredients except the green parts of the spring onions. Stir well and bring to a simmer. Add the sautéed cauliflower to this sauce and toss well to coat. Garnish with the green onions and serve.